President Mahinda Rajapaksa had a one-on-one meeting with Indian Prime Minister Manmohan Singh on the sidelines of the SAARC summit in Thimphu. This was their first meeting since the end of the Wanni War. There were occasions in the past year when they could have met, for instance at the United Nations during the General Assembly session. But they did not. Obviously, the Indian leadership was not too keen on the dialogue for reasons never spelt out in public. Rajapaksa- Singh last met when Colombo hosted the Saarc summit in August 2008. That meeting was marked by warmth and India’s outright support to the war effort. Communication lines remained open between Colombo and Delhi through out the war. While India did its best not to undermine the military campaign, and often had gone out of its way to side with Rajapaksa, his government remained sensitive to the Chennai factor till the last bullet was fired. Personal equations between Rajapaksa’s core team of advisors and Singh’s aides helped matters no less. So, it is natural to pop up the question what made the Singh-Rajapaksa equation turn cold? Was Delhi not keen hosting Rajapaksa through out last year? Diplomatesque being what it is, neither side will field these questions. And there will be no bytes to pep up a copy. Well it is easy to claim that Delhi is peeved at China walking away with all the top of the line projects that range from a harbour to rail lines? But the question is why India should worry when the profile of the two countries, in so far as Colombo is concerned, is neither identical nor similar. Yes, it is true that most China’s ventures in Sri Lanka are coming up in the North of the country, which is close to India southern coast. Again, one is tempted to ask: if so what? Some body has to foot the bill. If China is willing and ready to quickly make move on the economic chess board, so be it. Any how, the needs of Sri Lanka today as it embarks on an economic resurgence offer enough room for every friend of the country to play a useful role. It is for Sri Lanka to choose its friends and its interests. Delhi is not going to dictate to Colombo or redraw the priorities for its neighbour. It is pertinent to recall that Delhi did not stand in the way of Lanka-Pakistan military ties, when Gen Musharraf laid it all out for Sri Lanka: the services of Pakistan’s air force specialists along with arms, ammunition and even planes; and when a former director general of ISI became Pakistan high commissioner in Colombo. Much earlier, some three decades ago, Delhi did hot hold anything against Sirimavo Bandaranaike, a personal friend of Indira Gandhi, when Pak Air Force planes were allowed to refuel on the island during the 1971 war against India. All this not because of any feet of clay, if any, in the South block, but out of conviction that the bilateral ties are deep and broad based enough to withstand occasional grandstanding for whatever reason. Also note worthy is the fact that China is an infrastructure player in India as well with contracts from power to telecommunications sectors. Today’s China is marching in the footsteps of the long forgotten East India Company. Will Communist China end up as an imperial China with colonies dotting the three continents? It is too early to make any forecast, though history has a tendency to repeat at regular intervals. Naturally therefore the Sri Lanka imbroglio boils down to the very old issue which is political in content. It figured prominently at the 30-minute long Thimphu talks. Old timers may recall that Thimphu was venue for Lanka talks under the aegis of India when LTTE was in a mood to listen and talk. Nothing much came of that round because any negotiations can succeed only if there is some give and take. At the latest Thimphu round, Rajapaksa spoke about his government’s plans to reach a political settlement with the Tamil ethnic community and his hopes of a breakthrough this time around. Prime Minister Singh’s response is not known; it is said he gave a patient hearing as always to the Lanka leader, who is in a celebratory mood with his twin electoral success in a span of two months. It is possible the ‘reluctant politician’ at the helm of Indian affairs was stuck by the uncanny resemblance between the latest plan and the plan he had heard Rajapaksa outline as his host in August 2008. Then, as now, Rajapaksa said he would consult with all sections of the Tamil community, including those not represented in Parliament, to infuse a sense of participation and equality in the nation’s re-building process. It can be as vague as vagueness can be. The move to set up an Upper House of Parliament, while welcome as the second chamber can act as a check on unbridled exuberance of the lower house, the concept paper or whatever it is called on the proposal shows the Presidential advisors are set to herald crony democracy. Sri Lanka can afford to avoid it at this stage particularly when crony capitalism in practice in the army has become the talk of the town with Gen Sarath Fonseka behind the bars. There is no gain saying the home truth that politics of triumphalism are at the root cause of all the troubles in Sri Lanka. 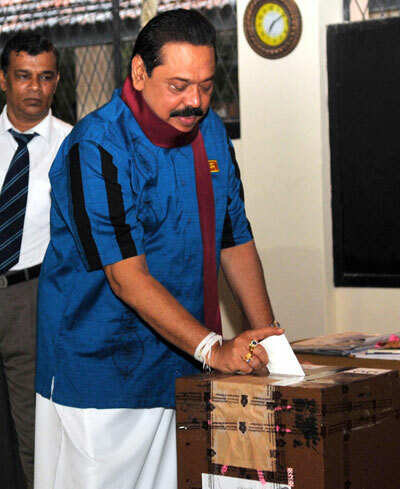 Unless Mahinda Rajapaksa uses his Mahinda Chintana to don the mantle of a statesman, his three victories in a row will be no more than a coma in the long history of the country. How he would go about the task is no longer a matter of detail in the face of two stark realities. One poor show by Tamil nationalists amongst the ranks of the ruling alliance at the recent hustings. Two the results of a referendum among the Tamil diaspora particularly in Australia, Canada and Britain. Both strengthen the contention that Tamil nationalism is still a force to be reckoned with in the country and cannot be left unattended. The decline of Tamil representation from outside the North and East should be a cause for worry to Rajapaksa. Hitherto, every demand for devolution of more powers to the North and East provinces is countered by the argument that more Tamils and Muslims live outside these two provinces. In fact that has been the standard response. Now that plank has blown to smithereens, the government must make a beginning with devolution without much fuss. There are differences amongst Tamil leaders, no doubt. Douglas Devananda, the EPDP leader, who is rewarded with a ministerial berth once again despite his poor electoral show, says 13th amendment plus, Anandasangaree says Indian model, and the TNA says federal system while some favour self determination, other advocate two nation’s one country. Exploiting these fault-lines is not statesmanship nor is postponing statute changes but playing footsie, once again, with southern chauvinism, since, as Devananda told the Island, a Colombo daily, the 13th amendment is not a new thing. It’s already in the constitution and implemented all over the country except in the north. In politics, like in war and diplomacy, what is feasible and practical is what matters and not hangovers from the past, when there are unresolved issues relating to rehabilitation and resettlement. Significantly these issues figured in the discussions Foreign Secretary Nirupama Rao had in Colombo in March (2010) and Foreign Minister SM Krishna had with his Lanka counterpart on the margins of Thimphu summit. Estimates put the number of IDPs still in camps at about 70,000. This is no insignificant number when celebrations are heralding the first anniversary of Wanni victory. Around 10,000 youth are held in detention without trial, which again reflects poorly on the administration and its resolve to give a sense of belonging to the ethnic minority. The spin on rehabilitation with dignity should go beyond media hype. Since the column started with a reference to Colombo and Thimphu summits, it will be proper and fair to conclude with a subject that figured in Singh-Rajapaksa talks on both occasions. It is related to a Comprehensive Economic Partnership Agreement (CEPA). On the eve of the Colombo summit, Indian official spokesman (Navtej Sarna) told a reporter ‘Let us see what happens during the visit (of Prime Minister Singh to Lanka capital). The position is that the agreement is under discussion’. And on the eve of Thimphu meetings, Foreign Secretary Nirupama Rao, said ‘That (CEPA) is still being discussed with Sri Lanka. We are prepared to move at the pace that they (Sri Lanka government) want in this particular context’. Well, this reasoning is in synch with the long held Indian position on all matters Sri Lanka because Delhi doesn’t want to bulldoze its way and is willing to wait till such time that both sides are equally comfortable on CEPA, which will mark a natural progression from the Free Trade Agreement (FTA) in operation for ten years. As noted economist Rohan Samarajiva observes, India matters to Sri Lanka, more than Lanka to Delhi. And without CEPA, the five-hub strategy of President Rajapaksa will not succeed, and Hambantota, which has sent him to the national political scene, will not bring smile to the pampered Chinese investors.